EcoBuddies™ Environmental Education Program provides standards-aligned online and print resources to help teach students about e-waste. “EcoBuddies will be an integral asset to schools and educators participating in our recycling program,” said Sean Michaels, president of FundingFactory. With the launch of EcoBuddies™ from FundingFactory, the nation’s largest recycling fundraiser for schools, teachers can bring service-learning into their classrooms through “green” lessons and activities. EcoBuddies is a free preK-5 recycling curriculum and fundraising program that helps students understand the environmental impact of e-waste while gaining subject-area knowledge and applying it to real-world projects. The cross-curricular environmental education program includes lesson plans, classroom activities, worksheets and quizzes, and a soon-to-be-released online interactive habitat. Colorful wildlife characters enliven the program and engage students throughout the standards-aligned curriculum. 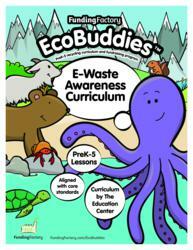 The EcoBuddies curriculum is available online at no charge to FundingFactory participants. Schools can sign up for free with FundingFactory to recycle used printer cartridges, cell phones and other small electronics in exchange for cash or points redeemable for new products in the e-Rewards catalog. FundingFactory will release the EcoBuddies online interactive habitat at the beginning of the 2013-14 school year. Featuring various outdoor scenes and wildlife, the digital environment reveals the participating school's progress toward its fundraising goal and provides students with a virtual world that reflects their recycling efforts in the real world. As schools collect more e-waste through the FundingFactory program, new animal characters emerge and students have an opportunity to earn rewards through quizzes and hidden tasks. Since its inception in 1997, FundingFactory has provided more than $31 million in funding to more than 50,000 schools and nonprofit organizations across the U.S., and saved 30 million pounds of waste from landfills. FundingFactory is a free recycling fundraiser for schools, nonprofits, and charities. Participating organizations can earn points redeemable for cash or products by recycling used inkjet and toner cartridges, cell phones, and small electronics collected from their communities and supporters. FundingFactory is a program of Environmental Reclamation Services, LLC, a Clover Technologies Group company. Headquartered in Erie, Pa., ERS is an R2-certified, ISO 14001-2004-certified, Zero Landfill Initiative company with more than 99 percent of its incoming material having been reused or recycled in 2011.